Not folded up all the way. Today I couldn’t help myself and bought a 1988 Dahon III folding bicycle for the price of one fatbike tire. I hauled it home behind my fatbike (I was pulling a trailer today for another errand) and immediately got to swapping out the springy old saddle as well as repacking the front hub and lubing the chain. It was operational, so I set off on a shakedown ride. 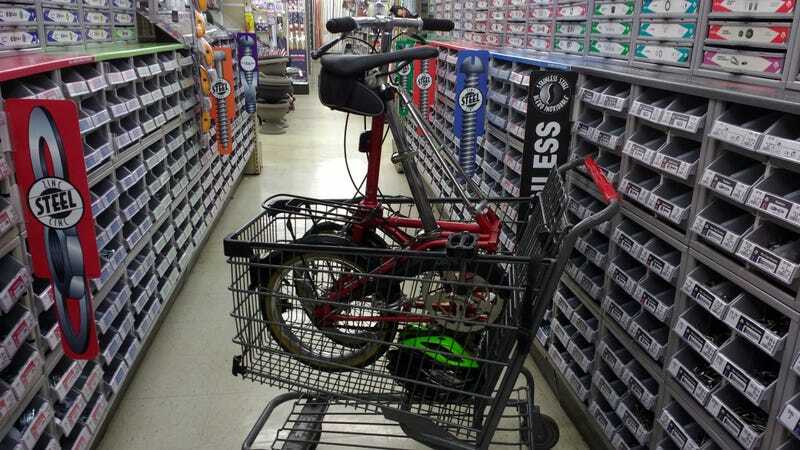 Arriving at Ace Hardware for a couple bits, I realized that I could just pick the bike up and set it inside a shopping cart, avoiding the entire process of locking it at a bike rack. One Ace employee found it to be quite amusing, although it probably didn’t hurt that I was snickering the entire time due to the absurdity of the situation. Having the bike right there made bolt selection extremely easy. Here is the thing in riding mode after buying too much stuff at Target later. The Target employees were flummoxed. I laughed. Before today I had never arrived at a store, put my mode of transportation inside a shopping cart, and walked through the store with it. This has been an enlightening experience, and I can now separate my life into two distinct parts: BFB (Before Folding Bike) and AFB (After Folding Bike). It has a 3-speed Sturmey Archer AW hub which is, predictably, geared too high. I covered about eight miles. Yes, it is heavy and slow and it needs some tuning, but it’s shaking (literally) out to be pretty entertaining at the same time. I want to use it to get to and from the local Amtrak station- the nearest station with roll-on bike storage is 60 miles away in Flint, so this will be much more convenient!